They are the hard workers who suffer silently for years. Right from getting squeezed into tight shoes to getting walked on hard floors, your feet literally carry you through life. Despite all the sufferings that they go through, you barely pay any attention to them. They are one of the most neglected parts of your body. Besides the beauty aspect, taking care of your feet will ensure an overall good health. Apart from shelling out your money on foot spas and expensive pedicures, a foot reflexology can not only make your feet feel great, but is also rejuvenating for your body, soul and mind. Reflexology is based on the theory that you have reflex points in your hands and feet which are in association with muscles, nerves, organs, glands and bones. Specific pressure on specific reflex points would activate the healing power and make balance in the body. Reflexology is different from massage. Reflexology is done on both hands and feet. But it is commonly done on feet as they are considered as the best site to implement reflexology. 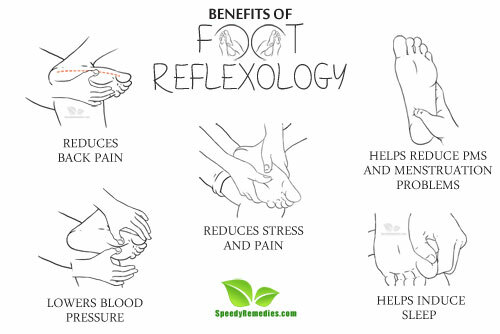 Regular practice of reflexology can improve blood circulation; cause relaxation and can improve your overall health. If you suffer from insomnia or sleeping disorders, a simple reflexology routine before bed can help you drift off to sleep naturally. Insomnia is mostly caused by chronic stress or emotional problems. It can contribute to anxiety, depression, cognitive impairment and memory problems. Reflexology can help relieve stress and in turn cure insomnia. It will help you relax the nerves, unwind your body and will improve your blood circulation. According to a 2011 study published in Midwifery, foot reflexology in the postnatal period significantly improved the sleep quality in postpartum women. You can use thumb or finger walking as per your convenience. Thumb walking or finger walking is a technique where the tip of your thumb or finger is moved slowly along the focus area. Walk your thumb in a slow, rhythmic motion in and around the large plantar of your big toe. The reflex point on the top pad of your big toe corresponds to the pineal gland that regulates the sleep hormone, melatonin. The action of thumb walking over the reflex point is effective in clearing the mind and body for relaxing sleep. Do this on both feet for at least 1 minute. Repeat it two or three times a day. Next, walk your thumb on the top pad of the second and third toe. Repeat this procedure two or three times a day. Do this regularly before going to bed. Menstrual pain is one of the most common prevalent problems witnessed in women with different intensities. It involves 45 -95% of women, states a 2010 study published in the Iranian Journal of Nursing and Midwifery Research. The study finds that reflexology is more effective than ibuprofen in reducing menstrual pain intensity and duration. When it comes to relieving menstrual discomfort, stimulation of certain pressure points increases blood flow to the uterus, thereby reducing uterine contractions or cramps. It also increases endorphin release to minimize pain. This improves PMS symptoms including irritability and mood swings. Another study published in 2002 in Korean Journal of Women Health Nursing finds that foot reflexology is effective in improving premenstrual symptoms like fatigue, insomnia, abdominal pain and constipation. Apply firm, steady pressure on the Grandfather Grandson point. It is located on the inner foot, where the big toe meets the foot. Do it for couple of minutes. Massage the entire feet as well as legs. Regular massage will help ease the pain. Any pain or tenderness in the spinal area causes back pain. The factors causing back pain include injuries, abnormalities, stress, pressure, muscle tension, improper standing or sitting position, and lifestyle. Back pain is related to spinal cord. Hence, to treat back pain, you should focus on the spinal reflex on your foot. According to a 2012 study published in the Iranian Journal of Nursing and Midwifery research, reflexology can be an effective treatment in reducing the severity of chronic back pain. Walk your right thumb in small sweeps on all of the spinal reflexes located along the inner edge of your foot, from the tip of your toe to your ankle. If you suffer from mid back pain, focus more on the middle area of the inner curve of your foot. Apply pressure there for little longer. For relieving lower back pain, apply pressure between the arch and the heel bone. End the session with the solar plexus reflex. Draw an imaginary line from the second toe down, below the ball of the foot. Your solar plexus is right within that hollow. Apply pressure at that area with your thumb and hold for few seconds. Do this whenever you experience back pain. Stress can cause long-term health problems ranging from heart diseases to depression. About 60-80% of primary care doctor visits are related to stress, and of them only 3% of patients receive stress management, states a 2013 study published in JAMA Internal Medicine. Symptoms of stress include aches and pains, dizziness, rapid heartbeat, increased susceptibility to colds and viruses, depression, irritability and moodiness. Reflexology promotes the release of endorphins. Endorphins are neurotransmitters that are natural painkillers. Reflexology can reduce the pain symptoms by stimulating endorphins. According to a study published in 2006 in Korean Journal of Rehabilitation Nursing, reflexology is effective in treating pain and depression. The study was conducted on middle-aged women with osteoarthritis. Divide the length of your sole from the base of your toe and your heel, into thirds. The point that is found at the junction of the first and middle third is the anxiety point. The anxiety point is connected to your kidney, heart, liver and spleen. Applying pressure with the tip of your thumb on the anxiety point. This will relieve stress and anxiety. The pressure should be enough to produce comfortable pain. Continue pressing for 2-5 minutes. Do this regularly on both feet. A majority of the pain experienced above the neck including headaches and migraines can be caused by tightening or contraction of the neck and shoulder muscles. According to the American Migraine Study conducted by American Headache Society, nearly 1 in 4 households has at least 1 migraine sufferer. Migraine prevalence peaks between the ages of 25-55. Head is represented by the big toe on the foot. Smaller toes on the foot represent sinuses and the head. Treat a headache by thumb walking over each of the toes and up the backs and down the fronts of the toes. Thumb walk along the crease between the toes and the foot. These areas will also help treat sinusitis. It will help clear nasal congestion and relieve painful headaches. In addition to the big toes, work on the small toes as well. Do this 2 or 3 times when you get headaches or migraines. After the first or the second treatment, a person might have a bad headache or migraines, but as treatment progresses these affects should gradually disappear. High blood pressure (HBP) or hypertension increases the risks of heart attack, stroke, angina, and kidney failure and artery disease. If left untreated, it can also cause death. HBP can be controlled using foot reflexology. According to a 2004 study published in Taehan Kanho Hakhoe Chi, foot reflexology is effective in significantly reducing the systolic pressure, and triglyceride in hypertension patients. For this, you need to massage the solar plexus reflex. Draw an imaginary line from the second toe down, below the ball of the foot. Your solar plexus is right within that hollow. Press and hold the solar plexus point for few seconds. Release and gradually increase the time to 1 minute. Press firmly with your thumb or rotate clockwise. Breathe in when pressing and breathe out when releasing. Do it twice a week for several weeks. Always support the ball of the foot with your hand while working on the toe. Take small sweeps when you thumb walk so that you don’t miss any area. Support the back of your foot while thumb walking. Consult your doctor before undergoing reflexology if you have burns, open or healing wounds on your feet, fractures and severe osteoporosis.